The meaning of the above extract from the Gita is “wherever Krishna exists, there exists Arjuna and when they are together success is sure to be around the corner. Krishan’s Geethopadesha (imparting the knowledge and meaning of life) not only enlightened Arjuna during the beginning of the war in Mahabharatha but also continues to influence and change the thoughts of the common people. Lord Krishna was born on Ashthami in the Hindu month of Shravana, July – August in Gregorian calendar. This year (2018) it is on 2nd September. He was born to Vasudeva and Devaki who were thrown in the dungeons by Devaki’s wicked brother Kamsa. According to predictions Kamsa was supposed to meet his end in the hands of Devaki’s eighth child. On the day Krishna was born and due to divine intervention all the guards fell asleep and the dungeon door flew open. 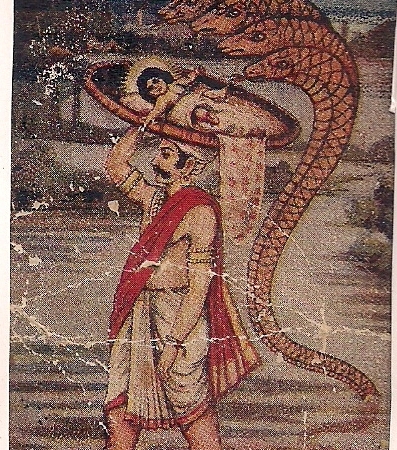 Vasudeva took the baby in an open basket and carried it on his head to his friend Nand at Gokul. 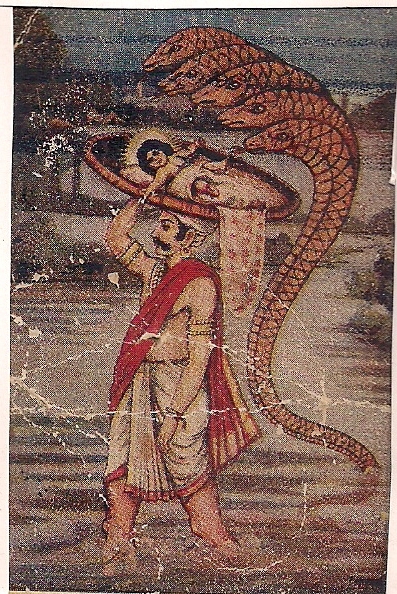 As it was midnight and raining heavily the five-headed Naga devatha (Snake king) shielded the baby with his hood and followed Vasudeva. River Yamuna helped Vasudeva to cross the river by splitting and baring the riverbed for him to easily walk across. Hence, Krishna Janmashtami is celebrated across the country with great joy, pomp and pageantry. On this day special Poojas (rituals) with chanting of shlokas are conducted in all the Krishna temples and devotional songs are sung in the praise of the lord. In places like Mathura (birth place of Krishna); Dwaraka (Krishna ruled this place); Gokula (the place where Krishna grew up) and Vrindavan (where Krishna spent time with his consort Radha), the festivities are colorful and special. 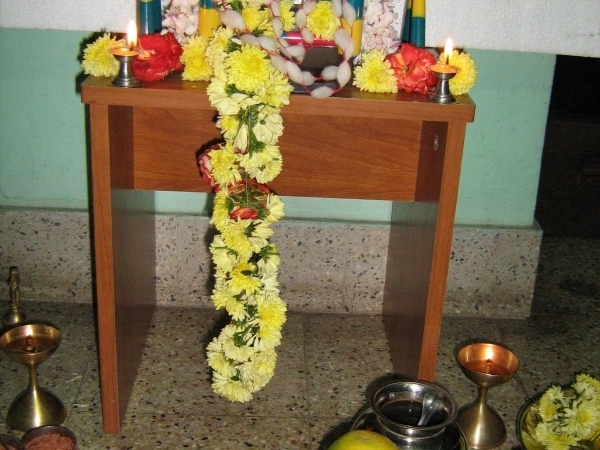 In Udupi, Karnataka (South India) the festival is celebrated in the Krishna mutt. 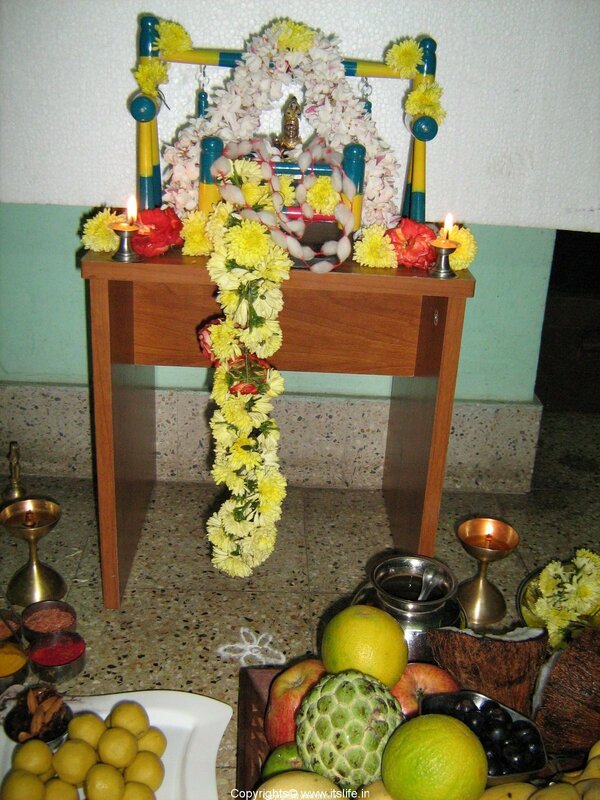 The devotees fast on this day and offer the pooja to the lord at midnight and then break the fast by consuming the Naivedya (offering to the lord). 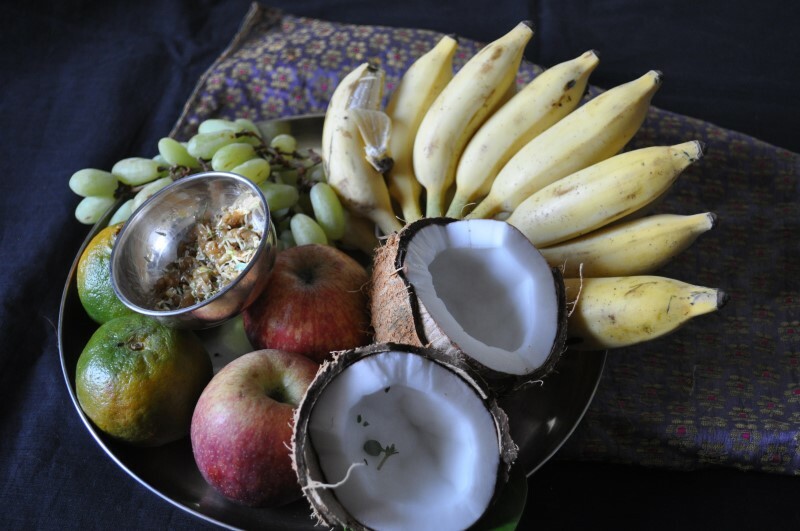 Varieties of delicious savories are prepared on this day and offered to the lord along with fruits, coconut, butter (Krishna’s favorite as a child), avalakki/poha (flattened rice) and milk. In Maharashtra the Dahi Handi ritual is carried out with great enthusiasm. An earthen pot filled with curds/yogurt is hung 20 to 30 feet above the ground and the group which breaks it by forming a human pyramid wins the contest. 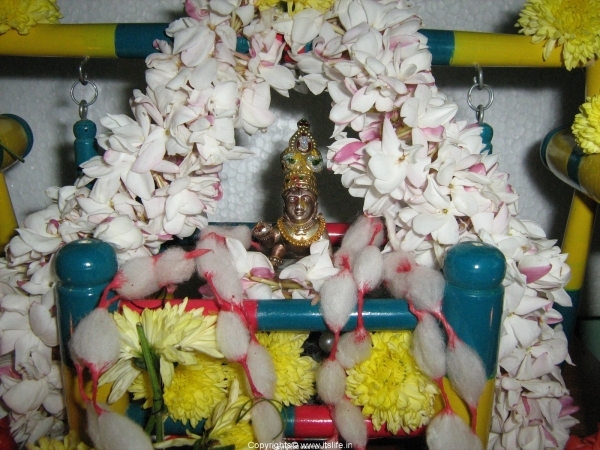 In households a small cradle made up of wood or silver is decorated and the idol of Balakrishna (baby Krishna) is placed in it and worshiped. A special Aarathi is performed and songs in praise of Lord Krishna is sung. The neighborhood women and children are invited home and are offered auspicious items like Kumkum, Turmeric powder, flowers, fruits, betel leaf and nuts and a packet of assorted savories. The women sing lullabies and the cradle is slowly swayed by a thread decorated with flowers. Baby boys are dressed as Krishna complete with peacock feather in the hair and a flute in the hand. Grandparents narrate stories of Krishna’s childhood pranks to their grand children. 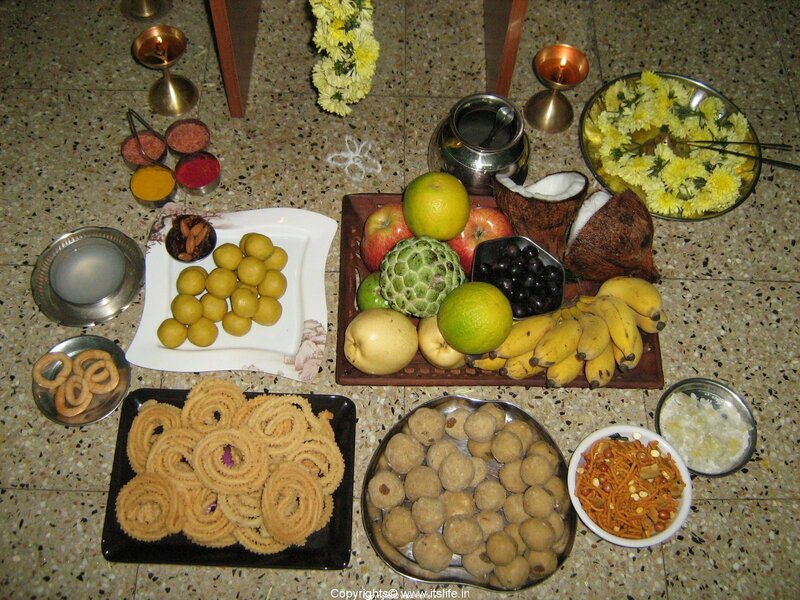 Some of the savories prepared on this day are Tengol, Chakkali, Shankarpoli, Kodabale, Karchikayi, Coconut Burfi, Besan Laddoo, Wheat Laddoo, Sev, Avalakki Chivda, Rawa ladoo, Mysore Pak, and so on. 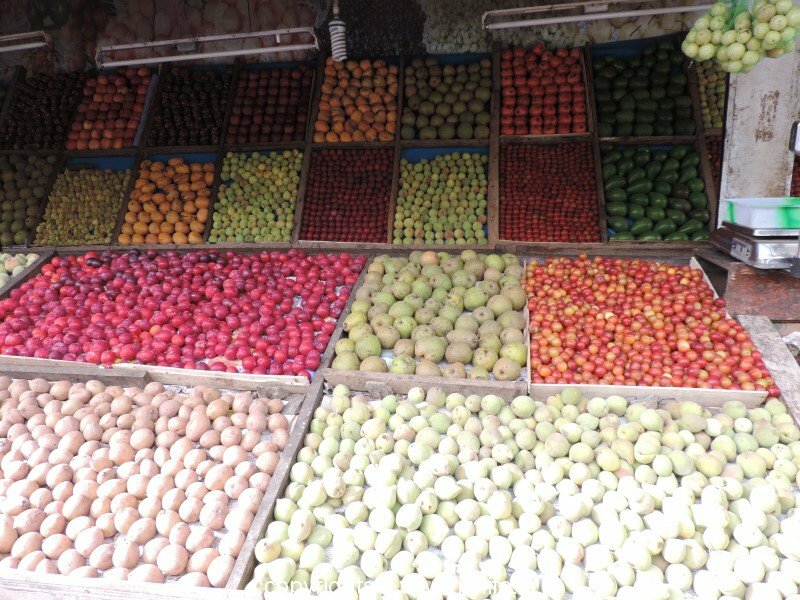 For other sweets, snacks and savories see Habbada Thindi and Panaka post. The cradle is Chennapatna art. Chennapatna is a place 60 kms from Bangalore, famous for the toy industry. You can check out in Cauvery emporium in Hyderabad you might get the cradle. Please accept my heartfelt congratulations on many of wonderful articles, which I have been following lately.It gives me insight into many rituals carried out by mum, BTW she is stll doing even now, alas back home..
One suggestion to your articles..When you are mentioning about Avalakki..It is commanly called as Puffed rice or Poha..Do you mind taking this correction? ?Please do not think other wise. Thanks once again for your insight to Life.. Thanks for following my blog. You are always welcome to give your comments on any matter in the blog. Regarding Avalakki…it is known as Poha in North India and Flattened Rice or Beaten Rice in English. Puffed Rice as you have mentioned is known as Murmura in Hindi and Kadlepuri or puri in Kannada. It feels glad to read your blog and about the Hindu festivals as we are unaware of many things. Thanks for posting all these!!!!!! Could you please let me know where we can find the mantras/Songs for various festivals which you have mentioned. I am glad you liked what you read here. It has been a good learning process for me too. Book shops near Raghavendra Swamy Mutt is an ideal place to buy books on Shlokas and festivals. 9th according to Vontikoppal panchanga.